Flowers can bring a bit of color to your homestead. Did you know edible flowers can also bring a bit of flavor to your food? Though flowers have been used in cooking since ancient times, the so-called foodie movement has made the use of edible flowers even more visible in recent years. The blossoms are easily tossed into colorful summer salads, folded into butters, frozen into ice cubes and placed atop wedding cakes. A number of easily-grown perennials can be added to your plots. Punchy, peppery nasturtium blossoms are good tossed into salads. Calendula can be sauteed and used as a substitute for saffron. Violets can be candied and used to top cakes. Some may already even be present in your garden: squash blossoms can be battered, fried and stuffed with cheese, among many other uses. One of the main considerations for growing primary flowers is that since they cannot be grown with pesticides, you need to have a robust integrated pest management procedure in place. “There really are no pesticides for edible flowers; organic pesticides are still pesticides,” said Steven Newman, extension specialist and professor of floriculture at Colorado State University. For small farmers, Love said a little companion cropping — and patience — will help keep little pests away from your edible flowers. “What will happen is you’ll develop a really rich ecosystem in the garden, and predator bugs will take care of the pest bugs,” Love said. “If you let mother nature do her thing, it will generally sort itself out. If you’re starting a new garden it can take a while for that balance to show up.” She also recommended adding bugs like ladybugs and lacewings to your gardens to keep pests like aphids away from your blossoms. After you have your land set up, wait until after the last frost to add the plants to the garden; most edible flowers can be sown directly in the ground. Water the plants regularly and consistently “deadhead” the plants, removing dead flowers to encourage new ones to grow. 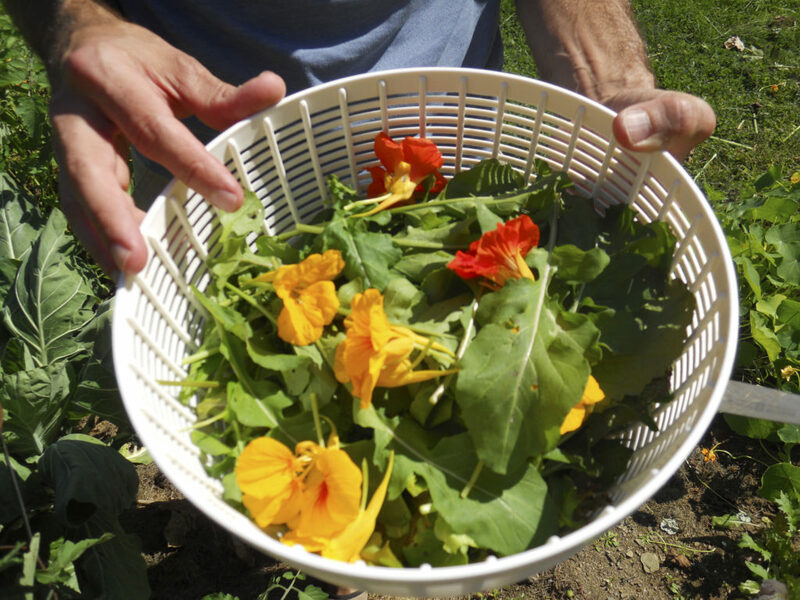 Timing is essential when picking edible flowers. Pick the flowers right when they have opened, and harvest early in the morning right after the dew has dried so the plants are still firm and not too moist. “The best practices for edible flowers is the pick them as early in the day as possible so they’re fresh and turgid from overnight not wilty from the heat of the day,” Newman explained. Love explained that, like with other flowers, the best practice is to cut along the stem down into the plant for a “deep cut” to encourage the plant to produce more stems of flowers. The petals are generally the tastiest part of the blossom, so removing the pollen-filled stamen and pistils from flowers can help with flavor and reducing potential allergens. Because the flowers are so fragile, they only need a quick dip in room temperature water before they are stored. You can gently remove any dirt or insects that remain with a small paintbrush or an unused make-up brush. “The flowers are not going to withstand any kind of disinfecting dip that you might use as a wash for washing lettuce,” Newman said. In terms of foraging for edible flowers, Newman said to do so “only if you know exactly what you’re getting” to avoid eating indigestible or poisonous blossoms. Newman said that while farmers markets are a good place to sell edible flowers for a small grower, it would be more difficult to sell them in a grocery store because of the product’s short shelf-life and small quantities. Love said that it can be fun to sell edible flowers, but not to expect an enormous profit. Still, it can be an interesting endeavor for homesteaders looking to diversify — and beautify — their gardens and kitchens. When is the right time to order seeds?